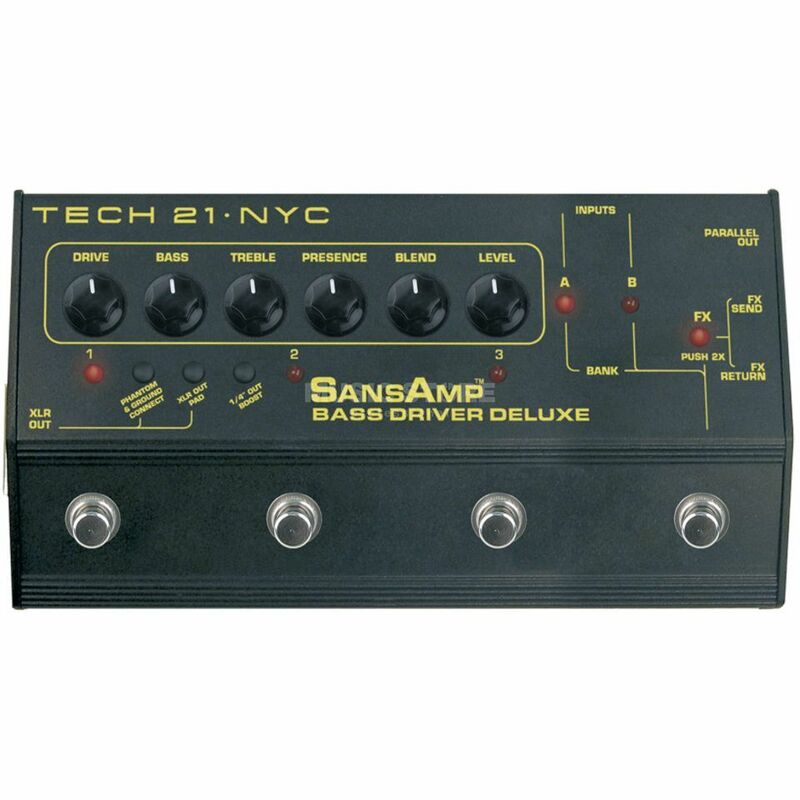 The Tech21 SANSAMP BASS DRIVER DELUXE Bass Guitar Preamp & DI, 6 programmable locations, effect loop, 2 inputs. Rich Fat SansAmp tones with clever routing for the live bass player. The Tech21 SANSAMP BASS DRIVER DELUXE is perfect for bassists who like to switch it up on stage. The SansAmp Bass Driver Deluxe is the ultimate live tool for the bass-hopping, preset-stomping player. The Deluxe is all about fast delivery of monster Tech 21 bass tones in the fray of a live performance. Dual inputs enable two instruments to be on-line and ready to go with a pop-free selector. You can program three custom tones for each input, or use all six for a single instrument. You can also program the FX loop to engage your favourite effect with a particular setting and the Deluxe will bring it every time that preset is selected. The fat, funky tones of the SansAmp Bass Driver series are legendary. With an all-analog signal path, two inputs, six presets, a programmable effect loop, and parallel/tuner out, the stage-optimized Deluxe is all that with cheese and pickles.